A center for community, family, education, organization, and much more. The Grange is a family-oriented fraternal organization that promotes harmony and cooperation among all persons interested in elevating and enhancing community betterment, family values, education, our food and fiber production system, legislation and a better way of life for all. The heart and soul of every local Grange is community service. Through strong local leadership and innovation, the Grange contributes to a stronger and better way of life for all Americans. No project is too big or too small. Grangers rally together to get the job done. Turkey Hill Grange has a long and proud history. Turkey Hill Grange was chartered in 1874 with nineteen members and quickly grew to 117 members just six years later. 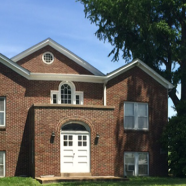 Turkey Hill Grange is the largest and most progressive Grange in the State of Illinois, including 4th and 5th generation descendants of some of our charter members. In early days, Turkey Hill Grange met in members’ homes, but we have had a Grange Hall since 1885, when the first Hall was built on one acre of land donated by a founding member for a school and Grange Hall. The first Hall was destroyed in 1904 by fire and the second one was removed in 1936 due to excessive needed repairs. We have been in the current Grange Hall at the same location since 1937. Turkey Hill Grange has many opportunities for you to meet members of your community and become engaged. The Grange is instrumental in growing the next generation of community members and leaders. We sponsor a local 4-H Club and the area’s first American Heritage Girls troop. These groups are able to have free use of the hall to hold meetings and host activities. The best way to give back to your community is to join forces in numbers. We have built lasting partnerships with civic groups and organizations to support and give back. We assist the City of Belleville by sponsoring the Annual Easter Egg hunt in the park. The Grange is also supportive of our friends at Scott Air Force Base through donations of household items and clothing to the Airman’s Attic. Turkey Hill Grange has established a Foundation to raise money for scholarships. Throughout the year we hold various fundraisers to support this effort. Graduating students have the opportunity to submit an essay and tell us where they see themselves in five years. Three scholarships are awarded from the submissions.